The rainbow smelt is a small fish up to 8 inches in total length. Rainbow smelts are distinguished from other Alaska smelts by prominent teeth on the tongue and a small adipose fin. The large terminal mouth is equipped with well-developed canine-like teeth and a slightly protruding jaw. 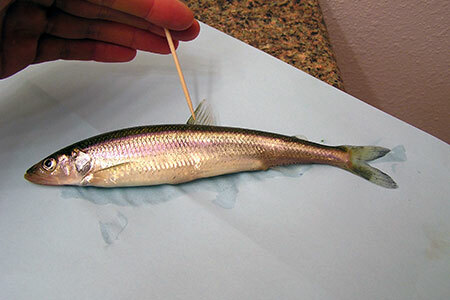 Rainbow smelt are generally olive green dorsally and silvery white in color in salt water. The sides of the rainbow smelt are often purple, blue, or pink iridescence with colorless fins. The top of the rainbow smelt’s head, chin, and upper part of the body are speckled with black. Rainbow smelt are anadromous which means it spends part of its life in the ocean and part of its life in fresh water. Rainbow smelt spawn in freshwater streams. As the spawning season approaches, rainbow smelt gather in large schools off the mouths of their spawning streams and rivers. Although rainbow smelt apparently returns to the river system in which it hatched, the return to spawning streams is often not precise. Rainbow smelt spawning rivers are typically slow moving waterways since rainbow smelt are weak swimmers that cannot travel through long stretches of high water velocity. Spawning sites are in the lower elevations of the river or stream, although some rainbow smelt even spawn in brackish water behind barrier beaches or in the tidal zone of estuaries. Eggs are "broadcast" over sandy gravel bottoms, once fertilized a sticky substance allows them to attach to sand particles. Their adhesive eggs, about 60,000 per female, attach to sand or pebbles. The eggs hatch in freshwater in 10 to 30 days, depending on the water temperature. After emerging from the eggs, young rainbow smelt migrate downstream to salt water to grow to maturity in the sea. After two to six years at sea, they return as adults to spawn. After spawning, the majority of rainbow smelt die. River currents carry newly hatched young to the sea where they feed mainly on copepods and cladocerans, in addition to rotifers, eggs, and algae. Adult rainbow smelt feed on decapods and mysid shrimps, copepods, amphipods, crabs, squid, worms, and a variety of small fish and shellfish. Since stream water temperature can affect the timing of the spawning migration, the numbers of spawning rainbow smelt returning to a particular stream can vary greatly from year to year depending on stream water conditions and overall ocean survival. The main spawning migration can occur as early as April in Southeastern Alaska. In Southcentral, Western, and on the North Slope of Alaska, spawning generally begins in May or later. Some streams can have two separate but overlapping migrations. In Alaska, rainbow smelt inhabit waters along the entire coast but are less common in the Gulf of Alaska as other species of smelt. 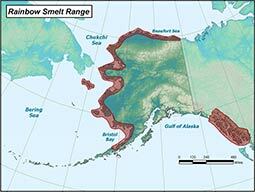 Rainbow smelt occur in Bristol Bay and north to Saint Lawrence Island. Rainbow smelt also occur off the mouth of the Colville River and east to Cape Bathurst, Northwest Territories, Canada. Population discreteness for rainbow smelt within and among river systems in Alaska is unknown, as very little information exists on rainbow smelt in general. It is clear that an understanding of rainbow smelt genetic population structure is necessary to identify appropriate management units for maintenance of biodiversity and productivity. Overall strength of rainbow smelt returns vary across the state by year and location. Why run strength remains strong in some areas while weak in other areas is unclear. The rainbow smelt is a small fish up to 8 inches in total length. Female rainbow smelt can produce up to 69,600 eggs and most but not all rainbow smelt die after spawning.